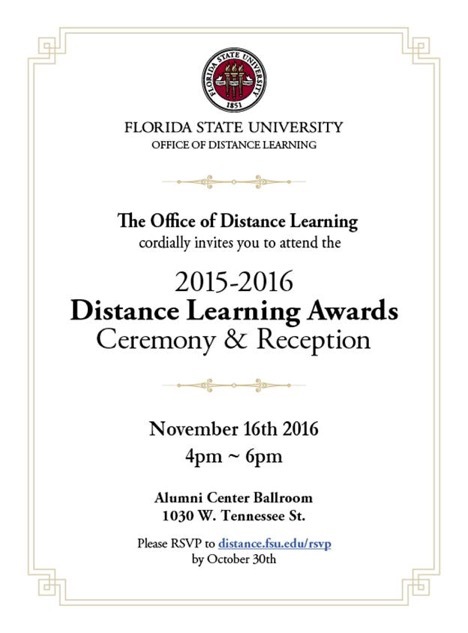 The Office of Distance Learning have announced the 2016 awardees! Assistant Teaching Professor Chalet Comellas will receive a faculty award and Michelle Davis will receive a Mentor Award. The ceremony and reception are to take place November 16th 2016 from 4-6pm in the Alumni Center Ballroom. Please RSVP to distance.fsu.edu/rsvp by October 30th.